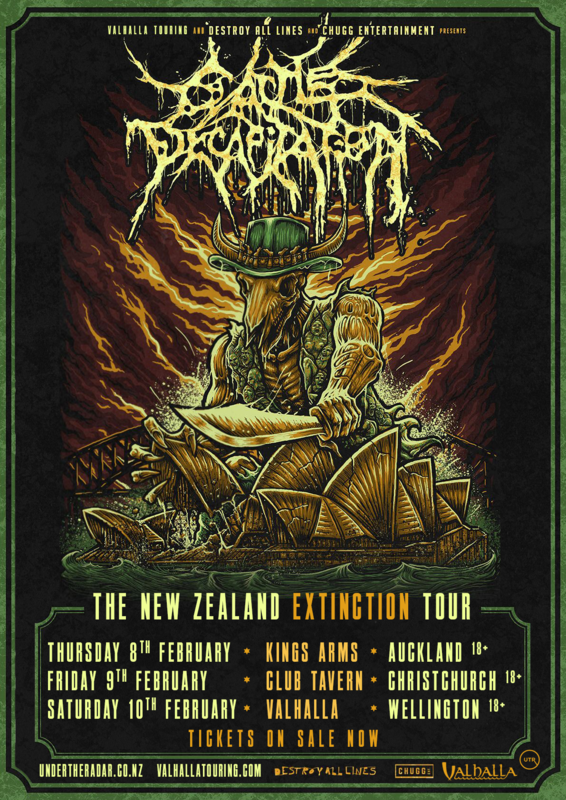 One of the most brutal, relentless and vital forces in extreme music, Cattle Decapitation will lay waste to NZ for the very first time in February! Compromise is not a concept Cattle Decapitation are willing to entertain. Ever. Over the course of twenty years and eight full lengths the San Diego quartet have more than proven themselves in the international metal scene and with their current album The Anthropocene Extinction (Metal Blade) they have delivered a volatile, apocalyptic beast that is as hideous as it is compelling. end of the death metal spectrum yet their most recent offerings have expanded their sound, allowing a little more melody in without losing any of their intensity. The brutality is underpinned by vocalist Travis Ryan’s bleak lyrics that bluntly illustrate the fate of the human race if it’s allowed to continue pillaging and destroying the planet.